It is hard to wake a sleeping newborn, and at no time is it harder than in the middle of the night. On Becoming Babywise (affiliate link) states “do not let him sleep more than five hours if you are breastfeeding” (page 112). This holds true until baby is 5-6 weeks old. Now, I am a rule follower by nature, so I have always followed this rule. The purposes of the rule are to 1)Ensure baby gets enough feedings in a 24 hour period and 2)Ensure mom builds an adequate milk supply. But it was not always (or ever) easy. To set my alarm and wake my baby in the middle of the night was no fun. I remember some moms commenting they didn’t follow that rule. Brayden: We didn’t start until 9 weeks old, so no need to follow the rule. I will say, however, that as you might expect, feedings were sporadic at night until we did Babywise, and nursings sometimes went more than 5 hours. We breastfed until a year with no supply issues. He started STTN at 6 months old. Kaitlyn: I followed the rule. We breastfed until a year with no supply issues. She STTN consistently around 3-4 months old. McKenna: I followed the rule, and had to wake her at 5 hours every night. We breastfed to a year with no supply issues. She STTN consistently around 2-3 months, but once she reached 5 weeks and I stopped waking her, she woke like clockwork at at that 5 hours for a while–which was frustrating. I had to wonder if sleeping would have been better without waking her–but there is no knowing how milk supply would have gone. So please share your experiences! I would love to get some real-life feedback on this rule. good idea for a post, i'm curious to see responses & to file this one away for future newborns :)so, we didn't really implement BW until 8/9 weeks old. from the beginning, i nursed my DS on a 3-hour schedule during the day (maybe too strictly at times), and always let him wake naturally after the dreamfeedish feeding. and naps just happened as they happened. at 8/9 weeks, we established an 8:00-8:00 schedule with normal waketimes and naps, and i misunderstood & dropped the dreamfeed at the same time. however, my little trooper slept 11 hours through the whole night at 11.5 weeks and we were done with night feedings! i have not had supply issues. I always woke my son. He started STTN at 8 weeks and my daughter at 16 weeks. Unfortunately, I lost my milk anyways at 5 1/2 months with my son and 5 months with my daughter. I tried everything to keep my milk; eating enough, drinking enough, not loosing weight to quickly, even went to the doc to see what she could do. No luck! I'm just one of the unluckily mommas who can't keep milk! It was a bummer. But, I am also a rule follower. My daughter woke me, she wanted to eat, but my son had to be woken. He still isn't all that interested in food at 23 months! We'll see how Phoebe is when she gets older. She loves her food (5 months)! I started loosely following BW almost right away with my son, and because of weight gain issues I did not allow him to go longer than 5 hours at night for the first 4 weeks. However, when we went for our 1 month check up, our Dr. gave me the ok to let him sleep as long as he wanted to at night…three days later he started sleeping through the night. Not every night, mind you (I wasn't THAT lucky!) but most nights. He's 2 1/2 months old now and now sleeps through the night almost every night. So far I have not had any supply issues. I started BW when my daughter was about 3 weeks old but had read the book while pregnant. At 2 weeks she started sleeping 5-6 hour stretches. Knowing that BW says to wake them up every 5 hours, I did so. But, after that first time waking her, she did not go back to sleep and had a horrible night. I vowed I would not do that again. I would wake her up during the day to not surpass her feedings but if she wanted to sleep during the night, I would let her. I figured if she was hungry, she would wake up. With that being said, I did have problems with my milk coming in but I can't say this is the reason why. I had issues with my milk coming in from the get go. I began with supply issues that weren't rectified until week 4, so I might not be the best source, but I can tell you what our plan was. We actually woke baby every 4 hours if he didn't wake on his own (he usually did – but I think that has more to do w my supply and him being hungry than sleep). So, yes, we intended to wake him. But only at night.Once supply wasn't an issue (I BF to 18 mos once we got it all worked out), we did wake him every 5 hours until about 6 weeks. That was when I started establishing wake time seriously and using my daily schedule. He began STTN at 7 weeks. I didn't follow the rule… I just let my newborn sleep. She was doing 5 hour stretches from the day we came home from the hospital. She usually woke on her own at night after 5-6 hours at night. She did occasionally sleep longer, but my milk supply didn't suffer. She was doing 10 hour stretches by 10 weeks old. We nursed until 11 months… I wanted to do a full year, but around 9 months she was too interested in everything going on around her and wouldn't latch on for more than a few seconds at a time, and my milk ended up drying up. I didn't follow the rule. My daughter came home from the hospital sleeping 5-6 hours. I just fed her when she woke. I never had any supply issues–if anything, I had too much milk–and she nursed until I stopped at a year. She was sleeping 8-9 hours by 6 weeks and we dropped the dream feed at about 15 weeks, at which point she was consistently going 12 hours. She was also a bigger baby (9 lbs) at birth, so I don't know if that helped. Every single night since the day I got home from the hospital with my baby boy until he was 8 weeks old, I woke my son up at 3:30am to nurse him (which was about 5 hours since his previous nursing). He was STTN at 8 weeks and his longest stretch was between 11pm-7am until we dropped the dreamfeed at 6 months and then he was 7pm-7am. I breastfed my son until he was 13 months. After I dropped the dreamfeed, I still woke myself up and pumped at 12:30am from months 6-11. Yeah – getting up at 12:30am to pump was not ideal, but I believe pumping in the middle of the night (even though my son consistenly STTN) helped me keep my supply, especially because I was working full time. Hmm, based on these posts, maybe this should be poll! I did not follow the rule, I did a dreamfeed at 10 and she would usually wake on her own at 4, so it was about 6 hrs naturally. I did not have supply issues, she has yet to touch a single drop of formula and is 9 mos. I also work 50 hrs a week and so I pump, so keeping supply up has been a bit of a struggle. But she slept through the night (8-5:30) starting at 8 weeks on and off and didn't wake up at night after 12 weeks. My husband was paranoid about our baby getting enough, and he is more of a rule follower than I am, so for his peace of mind I set my alarm. Although after a few days baby began waking himself after about 4.5 hours. He is 8 weeks now and is SLOWLY making his way toward STTN. I haven't had any issues with milk supply, sometimes I have too much. Naps have actually become more of a problem and suddenly he will only sleep for 45 minutes. 2 steps forward, 1 step back. 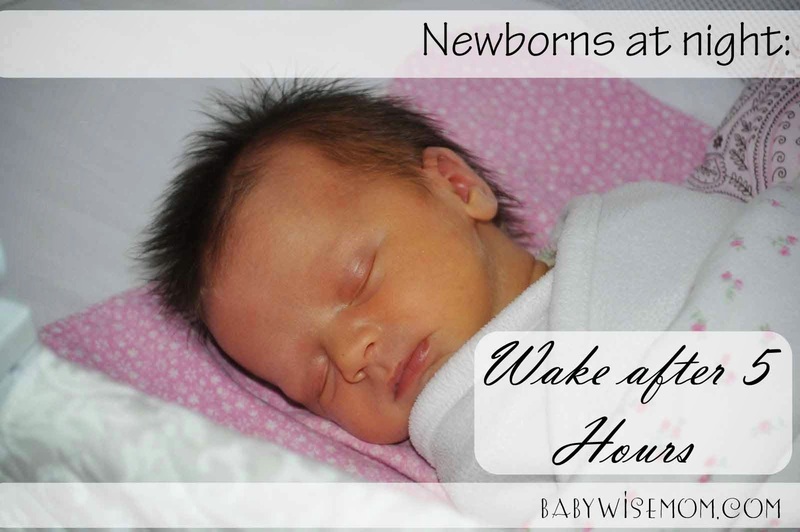 I followed Babywise with my newborn twins…it was the only way we would survive: to have them on the same schedule and to be good eaters / sleepers. I'm happy to say Babywise worked on BOTH of my babies…very different in personalities and preferences, so Im' a believer in Babywise! We did 3 hours feeding around the clock until 5 weeks, then I let them wake me up at night after the last feeding (10/11 pm). They immediately started doing 5 hr stretches and gradually lengthened until they slept through the night at 9 weeks! They have done so since (they are now 4 months old)…it was an easy transition.But yes, it was hard those first 5 weeks to go in and wake up TWO sleeping babies…but well worth it. I preface this my saying we started BW late.I did not follow the 5-hour BF night waking rule. Nor did I ever do a dream-feed. Our daughter started STTN between 6-8 weeks.I did have supply issues and ended up stopping breastfeeding at 6 weeks. I had PPD as well, and was on medication for that, so that did play a large part in my deciding to stop breastfeeding, and my supply declining. all i have to say… is that you all are an encouragement to me. i am 20 weeks pregnant.. and always knew i was going to do BW. i just finished the book… and hearing how everyday moms implement it has been great. knowing that everyone is a little different but that it still works! thanks ladies! I had not read BW with my first child until he was 2.5 years old. He actually co-slept with us until 6 months old – I know – so he was definitely getting breastfed during the night at less than 5-hour intervals. We breastfed until 11 months. With my second (BW) baby, I woke him every 5 hours for at least a few weeks, probably 5 or 6 weeks though I don't remember now, but I say that because I am a rule-follower too. 🙂 Anyway, he breastfed until 10 months after he had a nursing strike at 9 months. I have twins who are now 19 months old and we followed Babywise from 2 weeks (well, we followed it from Day 1, but the first two weeks we followed the BW advice to just roll with what came, get to know our two little babies, and make sure they got full feedings).From 2 weeks to 5 weeks, we did a dreamfeed and then woke the twins up in the middle of the night for another feed. This was a MAJOR production that involved two people spending almost an hour trying to keep two babies awake enough to eat. By five weeks, I was totally exhausted, those babies still didn't want to eat in the middle of the night, and on the understanding that the advice to do this feeding was out of concern for my milk supply, I started getting up to pump instead and let the babies sleep. I could pump in about 20 minutes while half-asleep and no one else needed to help. From this point, my babies slept through the night.We faced the typical sleep troubles between four and seven months, and then from seven months, we dropped the dreamfeed (which they were totally ready for), and I can probably count on my fingers the number of times I have had to be up with either of them at night in the year since then.I continued to pump at 3AM every night until they were 4 months old, using the expressed milk for the dreamfeed, which we always did with bottles. I breastfed both babies until they were 13 months old and never had any problems with supply. We started BabyWise immediately after our daughter was born. After her 2 week check-up the doctor said our daughter was getting adequate nutrition (as seen by how she was growing well and making enough wet/dirty diapers) that we didn't need to wake her in the night. In the pediatrician's words, "In the night- let a sleeping baby lie." So that's what we did. Occasionally she woke up before we had reached 5 hours, and I would feed her. But often times she'd go a full 6 or almost 7 hours. When that happened I would just express a little milk by hand to relieve some of the pain. Eventually my body adjusted to the new schedule. It didn't affect my milk supply or anything… just kept me uncomfortable for a few nights until my production had adjusted.Our daughter slept from 10pm -6am for the first time around 5 and a half weeks. I just let her continue to sleep through the night from there on. She's 11 weeks now and sleeping well– although we have since switched her to formula. We did not use the principles in Babywise until my daughter was 4 weeks old. However, I never woke her at night. She would sometimes go 6-7 hours between feedings. She slept through the night at 8 weeks. I had ample supply until she was about 3 months old… I believe it was unrelated to waking her up. She is 6 months old and has always been exclusively breastfed. With my first, I didn't do BW until much later, but followed the rule with her for the first month following dr. advice. She STTN around 8 weeks, but I woke her at 5 a.m. for first feeding. The second DD, did BW from the get-go, and I followed the rule for only about a month, then let her sleep. She STTN about 7 weeks, although inconsistently. Never had supply issues and I BF the first for 14.5 months and still BF the 2nd and she is 7.5 months old. I did BW from the beginning with my son but didn't follow this rule due to some advice my mom gave me. My son was sleeping 7-8 hour stretches around 3 1/2 weeks and sleeping through the night at 4 months. I was able to breastfeed for the first year without any supply issues. I never read the rule. I had an older edition of babywise (borrowed from the library) at the beginning w/my DS because I had loaned my copy to a friend and they moved. I never woke him at night. We did the last feed around 9:30/10, and he usually woke on his own sometime between 2 and 4, but mostly not til about 4:00. By about 5 weeks he was STTN til about 6:00. We dropped the "DF" at 13 weeks. I BF DS for just over a year. He did not gain all of his birthweight back until 3 weeks, however, so I don't know if that would have been different had I woken him. I had to wake him almost every 3 hours during the day, and we rarely got more than 7 feedings in a day. Looking back, I think I should have tried harder to get in an extra feeding or two, but I didn't know the 'rule'…lol….I think for this baby (due in April) I will try to get at least 8 for the day total. i have had 3 kids in 4 years and have never woken any of them at night. all of my girls started sleeping 5-6 hours at night within the first week and were all STTN (at least 8 hours) by 4 weeks and my middle child was sleeping 12 hours by 12 weeks. my baby (is currently 6 weeks old) and has been sleeping 9 (sometimes 10) hours consistently for the last 2 weeks. I nursed my first daughter until 11 months, and the 2nd until 8 months with no milk supply issues ever. i am VERY persistent about waking them during the day, though and never letting them go longer than 3 hours for daytime feedings…shooting for 2.5 hours if i am concerned about how much they are getting. i also cluster feed in the evenings (1.5 to 2 hours) they still get 7 or 8 feedings a day which is within the range for breastfeeding babies. also, none of my girls have ever had any issues with weight gain. I'm not a Babywise follower so I didn't follow this 'rule'. My son woke every 2-3 hour to eat until he was about 4 months old, and then started STTN at 6 months old (all 12 hours). I never had supply issues, but he always ate every 2-3 hours during the day too.With my daughter, she nursed every 3-4 hours from the very beginning, and kept doing that. She only nursed from 1 side each feeding, so I was worried about supply, but I had no issues. She also started STTN at 4 month (all 12 hours), and before then it was common to have 6-8 hour stretches no problem. It didn't affect my supply one bit, and she woke when she was hungry. I enjoyed my sleep! I have two kids. My first I didn't start BW until 6 weeks (hadn't even heard of it until then). I was doing on demand and was so grateful when I read BW. That being said, I did not wake him in the middle of the night. He started STTN at 11 weeks (11 hours probably). I did not wake my second child either. He was going 10 hours at 8 weeks. I remember waking a couple times earlier on when he had slept over the 5 hours and I had to pump because I was so full, but I still didn't wake him. He woke about an hour or so later (I didn't completely empty myself when I pumped, just took the edge off so I could sleep). I never had supply issues with either boy. I would love to know from you & others if you woke your babies during the day for that first week or so home or if you just watched your baby's cues & not the clock as the book suggests. Thank you! My baby had a hard time learning to nurse and staying awake long enough to get a full feeding and thus had a hard time gaining weight at first. Our lactation consultant and pediatrician had us wake him every 3 hours at night for a week, then allowed a 4-hour stretch until he was a month old, then he could sleep as long as he wanted at night after that. It was so hard waking him the first month but he needed it and it was good for my milk supply. I also woke him up for feedings during the day for a few months. We've successfully breast-fed for a year! We started babywise from time my now 10 month old little girl was born. We followed the rule for the first week until my milk really came in and the major engorgement passed. During the day, I fed her every 3 hours (waking her from naps to ensure this). I TRIED every 2.5 hours during the day and she would NOT have it, she wasnt hungry. The first night we didnt wake her after the 5 hours she slept 8 hours, but week 3 she was sleeping from the dreamfeed at 9-10pm until 5 am. By 2 months she was sleeping 12 hours at night. My little girl was 9.5 lbs when she was born so some people tell me it was because she was so big.She is now 10 months old and we are still nursing with no supply issues. In fact I probably had too much of a surplus in the beginning. We are preparing to begin weaning directly to cows milk since she is showing all the signs she is ready to wrap it up.I think following this rule depends on each mom and baby. Some moms have more trouble with establishing a supply. I pumped to ensure my supply. Some babies are just sleepers, I believe mine is. Hmmmm. I didn't need to do this with Olive because she woke up from day one at night every 2.5 hours, then slowly moved farther and farther apart, until it was df-3 am up on her own, then again at 6 or 7. Also, I can't get back to sleep for about 45 mins to an hour after I've put the baby back to sleep, so waking up at an established time is just not something I'm willing to do. I think, though, that with this next baby if for some reason he wasn't waking on his own for about 5 or 6 hours at night for the first month or so of life, I might get up to give him a dreamfeed whenever I woke up in the MOTN. I wake up a lot 🙂 After reading Healthy Sleep Habits I have a big belief that fragmented sleep, at any age, is not as restful as unfragmented sleep, so I'm not really keen on the idea of waking babies up to eat in the MOTN. I woke my daughter after five hours in the beginning and she STTN at 10 weeks. I have never needed to wake my son because he woke by himself at that age. Nursing has gone well with both of my kids. My girl started solids at 4.5 months, but I nursed her until 9 MO. I always set my alarm to wake my daughter at 5 hours but until 4 weeks she always woke me first. So for a few days I woke her at 5 hours. Later that week we were out of town and I forgot to set the alarm twice – she went 7 hours one night and 6 the other. At that point I was so relieved to get a little sleep that I decided to start letting her wake on her own at night. She still typically woke around 5 hours for the next several weeks but we got longer stretches in every few nights. I haven't had any milk supply problems. I did the first 4 weeks, but my pediatrician said, after that, that I could let the baby sleep as long as he wanted, as long as he weighed 10 lbs or more, and that if he was hungry, he would wake up himself and I should feed him then. After 1.5 weeks old, he only woke up one time at night. He would sleep for 5 hours, then wake to eat, and then sleep another 4 hours before waking to eat breakfast. He did that until 6 weeks when he started sleeping through the night. Thank you thank you to everyone for your stories! Very valuable! If you haven't noticed, I have a poll going right now with this question, so be sure to answer it, too. Ross and Taya, I woke my girls up every 2.5-3 hours. They didn't wake on their own to eat, so I woke them because pretty much everyone agrees that a newborn should eat every 2-3 hours initially. I also made sure they had at least 8 feedings in a 24 hour period. My daughter was a lazy eater and slow gainer, so I woke her every 3 hrs day/night, until 6 weeks. Then it hit me, wait, BW says babies start STTN at 7-9 wks! What am I doing! When I left her to her own schedule, she immediately stretched it out until she was sleeping 8 hrs at 8 weeks, 12 hrs at 10 weeks. But then I had supply issues, and barely hung on till 6 mos of BFing. 36 wks pregnant now with our son, will prob. do the 5 hr wake till 5 weeks, then add an hr each week. Will prob keep the dreamfeed for a while out of paranoia. We'll see how it goes. I didn't follow the rule and I haven't had supply issues. My baby is now 4 months old and she started sleeping through the night, between 8 to 10 hrs straight, around 6 weeks old. I always felt not waking her helped her learn to sleep through the night faster because she wasn't used to me waking her up, she never had that interruption to later wean off of. As long as she was gaining weight and having the correct number of soiled diapers in a day I never woke her up at night, she woke me. I have friends who said they wish they would have not woken their babies up because they never really ate well anyway when they did. Mollymoo,Cluster feeding is definitely worth a try and I would do that first. If that doesn't work, see the post "Early Morning Feedings Before Waketime"
Katie, I do think that I trained McKenna to wake every five hours. I think there is something to that theory. Oh, and also, even without CIO he naps well during the day. Usually for the last 1-2 hours of each cycle… in the moby, swing, or swaddled with a paci. At night we bathe him, massage with nightime lotion, feed him, then rock/pat for about two minutes, and put him down without any problems. Dani,I would say it is one of two things.One is that it could be he needs more food than three ounces at that night feeding.Another is I think it is possible to not sleep well before CIO because Brayden was that way. We started EWS routine on a 2.5-3 hour schedule at 4 weeks but did CIO starting at 9. At 9 weeks is when he went to one-two feedings in the night instead of every 2.5-3 hours. I would try more food if he will take it and then go from there. Just be patient, you will get there. Thank you for this post! I am off to a late start for Babywise for 2 reasons 1) I didn't know about it, 2) my son was 7 weeks premature. He is currently 11 weeks, 4 adjusted and we have been using Babywise for 2 weeks. He is exclusively breastfed, but I go back to work next week so he will receive BM via a bottle. I was told about Babywise when I mentioned to a friend that I needed him on a schedule because I am going back to work. So far so good!So I am trying to get him to drop the 2am feeding and go from 10pm to 6am (the dreamfeed and wake up time). I was using an alarm to wake me up at 2am and I have since turned that off. He managed this one night, but that same night he had really bad gas and was crying every hour and needing comfort (I have since bought Equate Infant Gas Drops per your blog and they are working great). I used a pacifier and it worked and he went from 10pm to 5:50am without feeding (but I still got no sleep). The next night, he went from 10pm to 2:15am without waking up. It was refreshing. At 2:15am I tried just giving him the pacifier but that didn't work so I fed him at 2:30am. I tried not doing a full feeding and shortened the amount of time on each side. After though, he woke 3 times between 2:30 and 6am, and was soooo sound asleep at 6am that I didn't him wake up. So he went from 2:30am to 6:45am without feeding but it was a rough few hours.So any advice on how I can get him to drop this feeding? Do you think he is too young to skip it being only 4 weeks since his due date? I am not doing CIO for 2 reasons 1) the daycare he will be going to won't do CIO so there wouldn't be consistency 2) being premature the crying will burn too many calories and we are still working on weight gain with the nutritionist at the hospital. So I want him to sleep at night without CIO. Any advice is appreciated! If I am doing the right stuff and just need to keep at it, let me know. Thanks! He might be able to pull that length at his age, but with him still being small, I wouldn't push it. I think you can turn your alarm off, but still plan on 3-4 weeks before he really can even possibly go that long. Some babies are 12 weeks before going that long, so you might have a lot more time. Hang in there! I know it is so hard in the moment. I promise it will end some day 🙂 Good luck! I have a 5 1/2 week old weighs 10.5 pounds. He's eating Q2.5-3 hours during the day (6:30, 9:30, 3:15, 5:30,7:30 then bed and dreamfeed 10:45-11). He has been like clockwork waking up at 2-2:30 regardless of when we do dreamfeed. He will only eat for 5-6 mins (usual breastfeed session is 20 mins) then go back to sleep. Then wakes up at 5 and I can do the paci thing and he goes back again until I feed him at 6:15-6:30. We have tried using the paci and on the two nights it worked and he fell back asleep till closer to the am feed. (Sometimes I put him in my bed during that time if he wakes up at 5 so it's easier to keep paci in but he's asleep)Thus I feel like he doesn't really need this Feed out of hunger but just waking up by habit. Any thoughts or experience on how to break that wake up ? My goal is to get him to sleep longer stretches at night and I feel like he's waking up out of habit and not hunger bc he can go back to sleep with a paci. Or should I just try to get him to feed at the 2 am feed by waking him up more and eventually he will drop that feed?